Amazon have been granted two patents for wearable tech to be able to help check and guide workers using wristbands. However many people are viewing this an Orwellian surveillance scheme. Frederick Winslow Taylor would no doubt approve! This entry was posted in Professional on 27 February, 2018 by Mr McGowan. Not good news for Glasgow Airport. 300 jobs expected to go. 11 flights being moved to Edinburgh from Glasgow. Troubling times. Brexit and high Air Passenger Duty to blame. Mind you, last time I checked, Edinburgh was still in Scotland too. This is the strike notification from UCU and I stand by the Union’s commitment to fight for fair pensions for all USS members. It’s not a difficult decision to make, despite the loss of wages, supporting the strike is a simple ethical choice for me. All my colleagues across the university sector are deeply committed to their work and their students, they work incredibly hard, and regularly put in many, many long hours for which they are not paid. It goes with the territory and there is an expectation that we do it for the love of our domain, which of course we do. But that doesn’t mean we don’t deserve decent employment rights, fair wages and a secure pension. Academia may be a calling, but it’s also a job. However I also have more personal reasons for supporting this strike. As is so often the case, punitive moves like this have a disproportionate impact on women, who already earn less over the course of their careers than their male colleagues, and those employed on precarious contracts. I was recently struck by this report in The Economist on the gender pay gap: The roots of the gender pay gap lie in childhood. The research was undertaken at Princeton University using data from Denmark but I suspect the findings, which highlight the disparity in men’s and women’s salaries after having children, are equally true of the UK. Becoming a father has little impact on men’s earnings in the long term, while the opposite is true of women. It was sobering looking at these graphs as they are a perfect illustration of my own career. Like many women, since having a child, I have worked part time in order to accommodate childcare and I have only been able to apply for jobs that provide a degree of flexibility. And this is with the support of my partner who plays an equal role in childcare. Clearly this has had an impact on my earnings, but more importantly, it has also had an impact on my pension contributions. Like many women with children, my pension will already be lower as a result of working part time, so I really, really can not afford to see it eroded further. 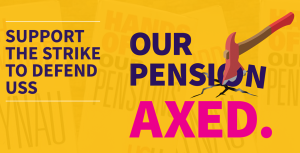 So that’s my added incentive for joining the strike, but when all is said and done, we all deserve a fair and secure pension, and that is something we should all fight for. Kleven, H., Landais, C., and Sogaard, J. A., (2018), Children and Gender Inequality: Evidence from Denmark, Working paper 24219. This entry was posted in Professional and tagged higher education, politics on 27 February, 2018 by Open World. Remarkable situation at KFC. Surprised they didn’t have assurances in place from their new supplier. McDonald’s et al must be making a few extra sales due to this. This entry was posted in Professional on 26 February, 2018 by Mr McGowan. I am just back from a run. It was not very fast and it was not very far and I really did not want to do it. I wanted to stay in my jammies and eat square sausage rolls with my husband and kids. I am not a glamorous runner. I do not glide along on slender, tanned limbs, gazelle-like, smooth ponytail swishing behind me. I do not glow. I sweat. I chunter along. I go bright red. I swear a fair bit. Especially going up hills. So I wasn’t exactly pumped about doing it, but I did it anyway and it was my first proper run in ages. I did not have a watch. I did not set myself any speed or distance targets. I just started moving. I stopped when I got tired and then I started again. After a while, I found a wee rhythm and I knew my body was taking over. My breathing settled into a pattern of its own, in, in, out, out, my feet and legs moving in time. The sun was shining and the sky was deep blue and I as I ran my heart swelled up with a feeling of total gratitude and thankfulness that I was here. Healthy, breathing and moving on this day, at this time, in this place. Sweaty, out of breath, looking a pure state, but here. What a privilege. That’s what running can do for me. It simples everything down to in, in, out, out, in, in, out, out. I don’t need to be anything except me. I don’t have to answer to anyone except myself. Running connects me to my body. It helps me appreciate the amazing things it can do for me if I just give it a chance. Instead of the depressing attention to cellulite and extra pounds, I can be glad and proud that I have a body that can run at all. I can notice what is good and strong. When you strip away all the nonsense about how far and how fast and how many calories, running becomes about time and space to just move. To be inside your body and be thankful for it. To notice how lucky you really are. Running has ripped my heart out more than once. When you strip everything back to in, in, out, out, you find out what’s really going on inside your own head. You find out what your self-talk is doing. If I find I am berating myself for walking before I get to that lamppost or cursing myself for stopping on this hill, I know I am not in a good place. Discovering I am being unkind to myself is never easy to deal with, but it is always better to know. I ran once on a cold and grey Saturday morning, unremarkable in every way until my chest exploded with pure, white-hot grief that had been locked in tight until that exact moment. The force of it brought me to my knees and I sobbed at the side of the road until I was totally spent. Running locates me in my own body and forces me to appreciate what’s good about it. Running helps me work out if I am ok or what I need to do next to be ok. It opens me up to creativity. It makes me a lightening rod for good, crazy, exciting and stupid ideas. I am too busy dealing with in, in, out, out to filter, so all the ideas and emotions get through. Unfiltered ideas and emotions are often the most powerful. It is time and space to be who I really am. Not a mum or a wife or a teacher or anybody’s anything. Just me, in my body, moving. I don’t know if running does any of that stuff for you, but I really hope something does. And I hope you do that something today, right now, on this sunny Sunday. And I hope your heart fills up. This entry was posted in Professional and tagged Uncategorized on 25 February, 2018 by susanward30. Last night I had the pleasure of attending a seminar at Edinburgh University's School of Education, Moray House. The title of the seminar was 'Reading the Evidence; Synthetic Phonics and Literacy Learning'. The title referred to one book edited by Margaret M Clark, and another 'Teaching Initial Literacy: Policies, evidence and ideology' again edited by Margaret. The first was produced in 2017 and the second is hot off the press, both being available from Amazon as either an ebook or paperback. Both are filled with contributions by leading academic researchers and writers on the subject of literacy acquisition and the use of evidence to inform this. The main contributors to the seminar, beside Margaret herself, were Professor Sue Ellis of Strathclyde University, Professor Terry Wrigley Visiting Professor at Northumbria University and Professor Greg Brooks from Sheffield University. Given that Margaret herself is a Visiting Professor at Newman University and Emeritus Professor at the University of Birmingham, you can see that this was quite a heavyweight corpus we were having the privilege of hearing from and engaging with. One of the things that binds all of them together is their commitment to research and the use of data, especially to inform practice in the early years of education, and the development of literacy in young learners. After a brief introduction and welcome from Professor Rowena Arshad, Head of School at Moray House, Sue Ellis took over as chair for the seminar. As part of her introduction Sue wanted to make three key points. The first was that good academic research should be used to interrogate all options, and looks at all of the factors that might be at play, not just some or one of them. Secondly, she cautioned that whatever our stance or point of view in regards to the debate around phonics and their use, classrooms should never be used, or become, battlegrounds fought over by different factions. Her third and final point was, that everyone should know the limitations of their 'evidence'. The evidence is never just 'black or white' in how it can be interpreted or used. Having been given those words of caution, Margaret now spoke about both her books and why she thought they were needed at the current time. She started by telling us that, through Freedom of Information requests she had discovered that the government in England, through the DfE, had spent no less than £46 million in just eighteen months on the purchase of commercial Phonics resources for schools, and that over half of that had gone to one individual and their company who acted as an 'unpaid advisor' to government! What particularly raised Margaret's hackles was the continued assertion by Nick Gibb, and others, that the statutory requirement, and mandatory expectation that all young learners in England should be taught Synthetic Phonics as the 'first, fast and only' route to successful literacy performance, and that this was 'evidence informed'. Margaret, like the rest of the panellists, asserted that her view was not that Synthetic Phonics is necessarily 'bad', just that there is no evidence to support any assertion that this should be the only method used to develop literacy in learners. Each speaker was to echo her view, based on extensive research of her own and others, that a mixed approach is one that is producing the best results in many systems. She detailed how synthetic phonics had become emphasised, above all other methods, in England following the publication of the Rose report in 2006. In 2012 a statutory phonics screening check was introduced in England for all six year olds. This consisted of forty words, twenty real words and twenty pseudo words, which the children had to read to their teacher. This started as a light touch diagnostic check, but quickly developed into a high-stakes accountability measure. The pass mark is 32 and the child has 'failed' the test with any mark lower than this, and has to retake the test the following year. Schools are expected to increase their pass rate each year, by the DfE and Ofsted, repercussions follow for schools and their leaders when this does not happen. Margaret observed that her first book had been subject to severe criticism in England and elsewhere, much of this from those with commercial interests in the promotion of synthetic phonics. It has been challenged in the UK for attacking Nick Gibb for his enthusiasm for synthetic phonics, for the fact that some of the contributors had cited Torgerson et al 2006 whose research it has been claimed has been challenged, and that the evidence from PIRLS published in December 2017 supposedly demonstrated the success of the government's synthetic phonics policy and the screening check. She concluded that whilst her first book was written mainly in response to the situation in England, and the second as a result of concerns regarding a similar direction of travel in Australia, there were definite warnings for Scotland in what had happened in England. She was already aware of pressure being put on parents to see Synthetic Phonics as the only way of developing literacy, rather than as another tool, that may be suitable for some, but perhaps not for others. Greg started his input by stating that he was a self-confessed nerd in terms of literacy, phonics and grammar and had spent his career working and researching in this area. His first strong statement was 'There is still no evidence that any one phonics approach is any better than any other' as he explored synthetic and analytical phonics, whilst also touching on the ITA (Initial Teaching Alphabet) something the younger members of the audience had no knowledge of. He was a member of the group that had produced the Rose Report and was quite dismayed how this had been used. He stated that he and a colleague had done a 'fact-check' on all of the commercially available resources available to deliver synthetic phonics and had found many of them contained basic language and grammatical errors and misunderstandings. 'Some don't know the difference between their diagraphs and their diphthongs'. They had been able to provide the DfE with a list of resources that had been checked for factual errors, but they were still unsure of their usefulness in teaching synthetic phonics. The quality of materials available to schools is questionable, to say the least, and now there is a move to roll out the use of synthetic phonics in adult literacy learning courses. He pointed out that if there was a lack of evidence for the sole use of synthetic phonics with younger learners, there was absolutely none with regard to adult learners. Step forward Terry Wrigley. Terry had looked closely at the 'evidence' and data being cited by Nick Gibb and others, and had found some interesting results. He started by looking at the expected impact of synthetic phonics on reading for understanding by the end of KS1 at age 7. He observed that most schools actually began their mandatory synthetic phonics courses in 2007, but he looked at the data for this factor from 2001 through to 2012 and had found no statistically significant improvement or change in the results for 7 year olds. He then turned his attention to the expected impact on reading tests at the end of KS2 at age 11. Again there was no significant variation in results, except in 2016 when percentages plummeted following Michael Gove's imposition of harder tests to bring more rigour into the process! When he had looked at the PIRLS data published in 2017, he found that England had risen from joint tenth, to eighth. However, they had gained only half as many points as in the previous cycle prior to the imposition of synthetic phonics as the sole mandatory way of developing literacy in early years. What he also noted was the significant improvement in literacy levels being achieved in both the Republic of Ireland and Northern Ireland, so had contacted colleagues there for their observations. In Northern Ireland (6th in PIRLS) when pupils meet unfamiliar words they are encouraged to use a 'range of strategies to decode them'. Children are also encouraged to use their 'current knowledge of the phonetic code while cross-checking with meaning.' In the Republic of Ireland (4th in PIRLS) the approach adopted is one of mixed phonics, along with sentence and textual focus. His colleague in the republic confirmed that experiences were used to support emergent literacy in early childhood, with a consistent emphasis on oral language, in the context of play. Emphasis was given to both word identification and comprehension, and there is a focus on genre as a basis for comprehension and writing. Terry observed that the results in both these countries, and how they had been achieved, were definitely worthy of further investigation. There then followed a short discussion around issues and questions raised by the audience. A significant element of this was around the ethics for teachers in adopting and applying a blanket method approach to all learners. Sue said she had concerns with approaches that identify those who are behind, using means that may or may not be valid, then putting all of those learners onto the same programme. She feels passionately that it is the teacher's job to diagnose learning issues in children, then address these as required, rather than the adoption of a resource or programme where everyone gets the same input. Such an approach might not only pedagogically questionable, it is also ethically questionable. It was a fascinating and illuminating session for me, and I suspect for others in the room too. There is no doubt this is a controversial area at the moment, but it is important that we all engage with the evidence and differing opinions to help us find our way forward, and one which will produce the best outcomes for our learners. There are no 'silver bullets' in education and learning, but it is too easy to allow ourselves to be driven by political ideology and dogma, or by the loudest voices, rather than taking the time to consider what the evidence and data is telling us. As a school leader, I always favoured a mixed approach, including synthetic phonics, which was tailored to individual needs, rather a slavish adherence to a particular programme, resource or approach for all. This is not always the easiest approach, and may not be possible in all circumstances, but is one I think we should be aiming to get back to as soon as we can. I really do hope we, and Australia, learn some of the lessons from England to prevent us from sharing many of the same outcomes. I would commend Margaret's two books to anyone who is interested in this area and wants to find out more. They are full of chapters from academics and researchers from across the globe. Thank you to all the speakers for making the one and a half hours so interesting and informative. Thanks for the pre-prepared notes which helped and allowed me to fully concentrate on what was being said. Sorry if I have slightly misquoted anyone, I did make some of my own notes, and I wanted to write this as quickly as possible whilst everything was still fresh in my mind. This entry was posted in Professional on 23 February, 2018 by George Gilchrist. Some reflections on having been in my permanent post for a month. That’s it. No more Acting. It is different to before. I feel a little more empowered and a lot more privileged to have been chosen to be doing what I am for real. But some things are no different. My vision. My aspirations. My optimism and passionate desire to make every child and adult in our school community achieve the absolute best they can. This entry was posted in Professional and tagged Uncategorized on 23 February, 2018 by lenabellina. This is the first of a semi-regular series which will outline suggested apps/tools/technology that could help enhance learning and teaching. After the exams last year, I asked the pupils if they used technology to help them study. Quizlet was one of the most commonly mentioned tools. At one level, Quizlet is an electronic version of good old fashioned flashcards (see Wikipedia for description of flashcards) which can be useful when trying to memorise terms and definitions. Since Quizlet is computer based, it has the potential to be much more powerful than paper based flashcards. In particular, the ability to share sets as well as being able to borrow and adapt sets that others have created could be a significant time saver. There are two things I particularly like about Quizlet. I like the potential for collaborative work. Pupils can create and share sets; they can work together on Quizlet Live and teachers can build on and work with other educators. I also like the diagrams feature; not something I've used with a class yet, but it looks particularly promising (examples on the Learning In Hand page cover Spanish, French, Geography...). 1) Brief look at the iPad app - focus is on how pupils could use it to help them learn terms. 2) Brief look at the website - focus is on using classes to share cards with pupils including a quick look at diagrams. This entry was posted in Professional and tagged flashcard, iDea, Quizlet, Revision on 23 February, 2018 by David.